The OH-5 Plus+ is the same size and shape as the original blue Oasis, but has a different liner which provides 50% more humidity output. 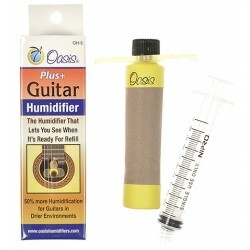 Use the OH-5 when the environment outside the case has a relative humidity of 25% or less. Each OH-5 comes with a stabilizer bar for mounting the OH-5 humidifier and a 10 cc syringe for distilled water filling control.